Even better, HRWRP’s most recent reclamation project, Lyons, was completed December 23, 2005. What a great gift for the Huff Run stream! In addtion, HRWRP’s watershed plan was recently endorsed by the state of Ohio. Homeowners in critical areas of Oakdale, Hollister, Congress Run, Greens Run, Millfield and Redtown may be eligible to receive cost-share money to install or upgrade their septic systems. For more information, see the brochure. Please note: You must be entirely finished with your upgrade and have all paperwork complete by March 31, 2006 to receive reimbursement. In 2002, Rural Action Sustainable Forestry (RASF) launched the Welcome Wagon Initiative in conjunction with Ohio State University Extension. The initial program provided a landowner resource packet to new woodland owners in Athens, Jackson and Washington counties. The tool is designed to help new forest owners to have a better understanding of their resources and to provide them with contacts needed to make informed property-management decisions. Since then, the program has been extended to eight counties in southeast Ohio, and RASF hopes to expand the resource into a total of 14 Appalachian Ohio counties by the year’s end. For more information, call Shana at 740-767-4938. 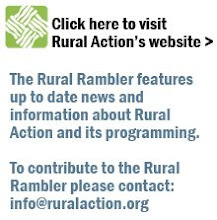 This week, the Rambler introduces podcasts of Rural Action’s radio show, Volunteer Action. A “podcast” is a digital recording of a radio broadcast or similar program, made available on the Internet. You do not need a personal audio player (i.e., an iPod) to listen to a podcast. Just click on the “play” button under “Links” on the left sidebar of this page. In this week’s podcast, you’ll meet Dennis Hosack. Hosack is Rural Action’s new Director of Conservation-Based Development. Listen in as he explains why he is both a conservation biologist and a hunter. If you can’t get the play button to work, try listening here. In her critically-acclaimed book, Worlds Apart: Why Poverty Persists in Rural America, published in 1999, Cynthia M. Duncan explored why some families stay mired in poverty generation after generation, and why some regions of the country are chronically poor and depressed. Her book was based on a five-year study of the lives of residents in isolated areas of Appalachia, the Mississippi Delta and Northern New England. Click here to read an interview with Duncan.